Chronic obesity-related disease drives up the cost of healthcare, which impacts profits and productivity. Sugar-sweetened beverages are a leading contributor of obesity in the United States. Worksites have the opportunity to help employees and customers make better beverage choices by creating healthy beverage policies and offering healthy beverages whenever and wherever beverages are served. 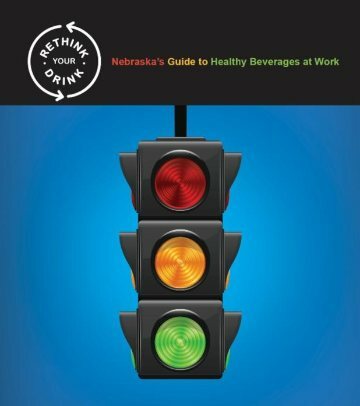 The Nebraska Guide to Healthy Beverages at Work makes the healthy choice, the easy choice. Communities across the country are focusing on efforts to improve community wellness by reducing obesity rates. Through our Healthy Beverages at Work initiative, we help businesses and organizations of all sizes to institute healthy beverage options, including vending policies, by following a stoplight approach - making the healthy choice the easy choice. Access a variety of resources and download this free step-by-step guide to implementing healthy beverage vending and options by clicking on the Nebraska's Guide to Healthy Beverages at Work image. 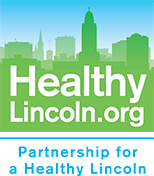 Lincoln organizations are already participating and seeing results. Read how some of these organizations have added healthy beverage vending to their existing wellness efforts. This Guide uses the stoplight color symbols to help business leaders and employees understand the variety of beverages on the market. Worksite wellness groups can use this Guide to be intentional and promote healthy, green beverages while eliminating red, sugar-sweetened beverages. Placement - Something as simple as where the products are located influences what we buy. By placing healthier beverages in the top slots, closer to eye level or in the front of the refrigerator will encourage healthier choices. Promotion – Advertising works! By having the front of the vending machine promote something healthy will encourage people to choose that option. Price – The field of economics is based on the fact that prices change what we buy. It is important to make sure healthier items are not more expensive than less healthy items which discourages the purchase of healthier items. Even better is to make the healthier choice less expensive than the unhealthy choice. Products – Some of the most successful changes make the healthy choice the easy choice. However, having full calorie beverages on hand makes the unhealthy choice too easy. By gradually removing full calorie beverages from vending machines and employer-stocked refrigerators, we make the healthy choice the easy choice. Start by reducing the number of full calorie beverages and eventually remove them altogether. Whether you’re ready to make a change or just need more information, click here to tell us about how we can help.